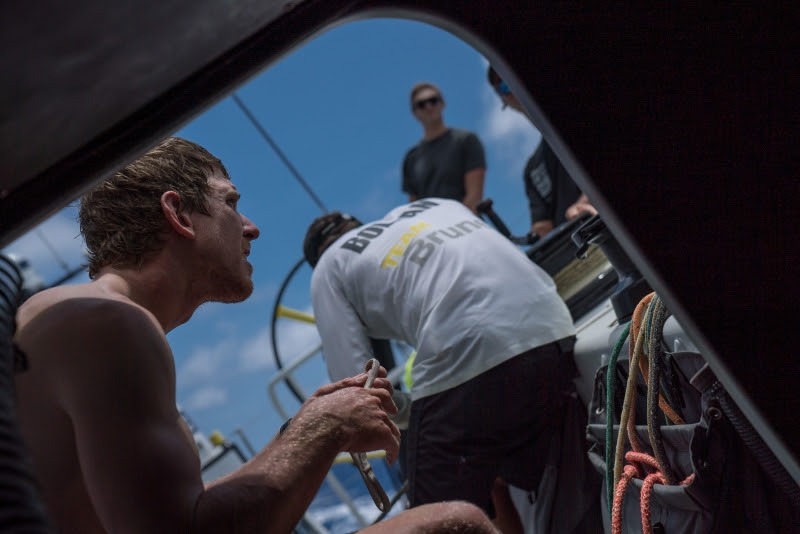 Team Brunel emerged from Stealth Mode overnight as the furthest east in the fleet, and by the 1300 UTC position report on Saturday, Bouwe Bekking’s team was in second place as measured on distance to finish, despite being the northernmost boat in the fleet. Yesterday, it was obvious we were falling off the pressure the three leading boats had,” explained skipper Bouwe Bekking. “You can keep following them, but then you know you’re going to keep losing. It’s clear now that Brunel will be pushing the direct route to New Zealand. They will be sailing far fewer miles than the other leading group who are committed to the west, hoping to find more wind to compensate for the additional distance sailed. “The key goal for us is to get south,” said Scallywag navigator Libby Greenhalgh. “The forecast is still uncertain, but there is definitely pressure to the south and the more we can hook into that the closer we’ll get to New Zealand before the forecast becomes very unclear. Behind and taking a middle option on the East/West axis is Dongfeng and MAPFRE, the top two boats on the overall leaderboard, now racing in unfamiliar territory at the back of the fleet. But all hope is not lost, as they claw their way back in terms of distance to the leader, which is now down to just 37 miles. “The weather forecast keeps changing quite a lot in the files we receive during the day,” said MAPFRE skipper Xabi Fernández. “We have nearly 1000 nautical miles to go so we will keep our hope until the very end. In Auckland, the Volvo Ocean Race Event Village opened on Saturday. Everything is ready, awaiting the stars of the show.